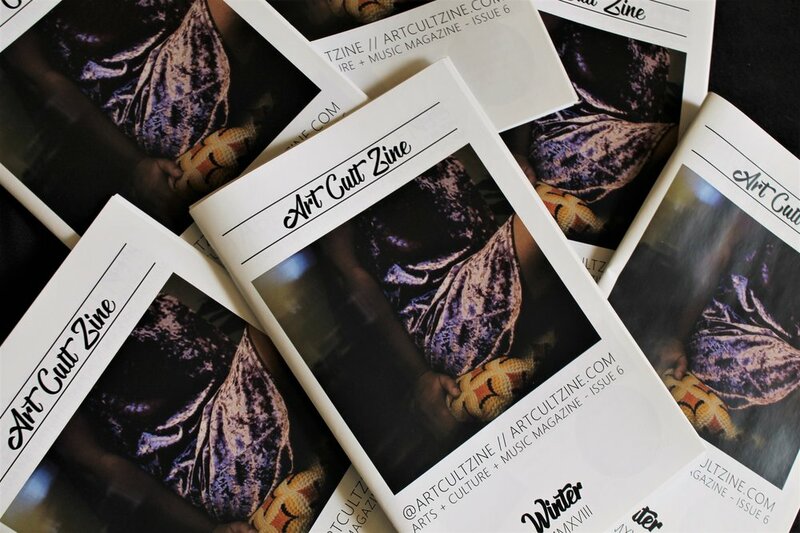 Aubrey Jernigan curates Art Cult Zine, a quarterly magazine that features a variety of creatives from all mediums along side her favorite albums of the season, artist interview, album reviews and original photography. When did you first get into zines? I’ve always been into anything print design, especially magazines. I have always studied layout design, composition, fashion editorials, paper quality and color theories. I’m a nineties kid, so zines were pretty big back then. You would grab a sharpie, fold pages together, and everything was more hand-drawn. After studying the work of others in art production I felt like, as an adult, I could mix traditional zine style with eclectic pieces and really create something that a lot of people could be into. After spending several years in Chicago’s art scene, studying digital multimedia design and just getting submerged in its culture, I moved back to OKC and wanted to start my own thing that kind of encompassed different skills that I had picked up along the way. I had tried getting my own personal artwork out there, and even applied for artist grants to find funding, but I had always been turned down. I noticed a trend in the city of the same people getting recognition over-and-over again and felt the need to create a showcase for people who are just starting off and need recognition. Out of the frustration for the lack of exposure and outlets creative people have in OKC, I decided to make my own path for myself and others in the artist community. Why did you decide to make a zine? I’m an artist myself, but I also really enjoy the production side of things. 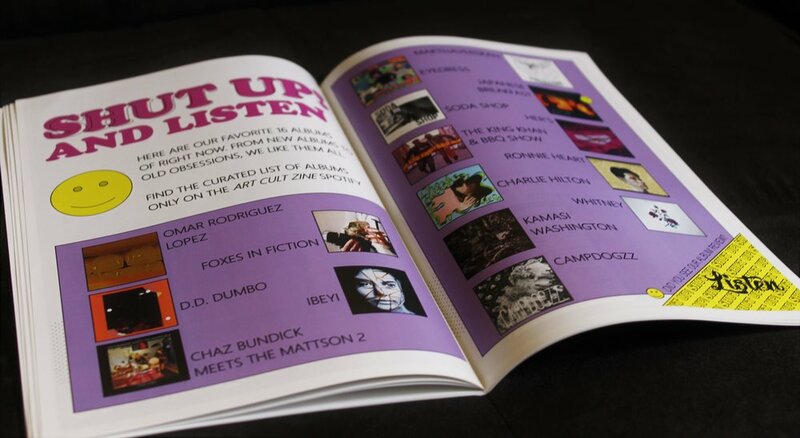 I wanted to curate a mini magazine with everything I enjoy about arts, culture and music all in one product. I saw an opportunity to showcase fellow creators and spotlight them while stretching my own creative muscles. Originally this publication was for Oklahoma City locals only. After the first issue, I had submissions from other cities, states, and even other countries. I thought it would be a shame if I limited the content to only one city, but I still try featuring at least one OKC creator in each edition. This zine is really nice for collaborating with OKC locals and giving others a chance to have their vision showcased. What roles do you usually play in putting your zine together? This is a solo project as of right now. Even though I word things on social media as “we”, I’m lying! It was/is a tactic I chose to do in the beginning to make people think this is a legit operation (haha). Like, people would take it seriously if there were multiple people behind it? You may also notice that I never post images of my personal work, or even myself, on the website or social media. I like to stay anonymous- a lot of the content has an androgynous feel and I want all of my readers to like the magazine for what it is and not be swayed by who made it. It’s just me doing all of this, but eventually I would like to form a creative team. I would love to offer permanent jobs for creators. It would be a dream to run my own operation and work with others who are just as driven as me. I also try to apply to/attend a few zine fests a year. It’s a great excuse to travel to different towns and meet fellow zine-makers. It’s fun to just chat and talk about art with cool people who are into what I’m into. I’m also the worst salesperson ever, so schmoozing and promoting my zine in these situations feels more natural. Staying curious is a really great tool for allowing yourself to continue growing in your field. I find inspiration through art directors and creators on Instagram. And I research creatives. I read about them and analyze their interests. If I go somewhere in public and they have hard-copies of something that looks interesting, I will always pick it up. Most of the time, after I read it, I end up tearing out pages that I’m into and keeping them in a folder or drawer. 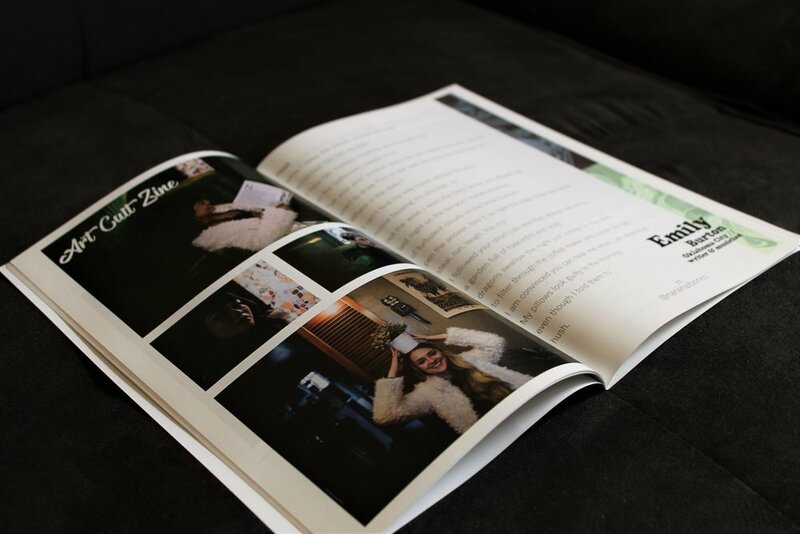 What has been the most surprising part of building a zine? o one is staying on top of me making sure any of this gets done, so I have to be really organized. This is the first big project that I have kept up with all on my own. I guess I’m surprised that I have stuck with it for so long- keeping up the momentum can be very challenging sometimes. I didn’t expect all of the tedious things to be so gratifying, like folding each page and stapling each issue until my fingers are sore. I like to add a personalized post-it note to each order to just let them know how honored I feel that they are interested in my project. Sending packages to other states and countries is surreal when you see that the person on the other end received it and they are actually excited to have something that I made and put so much effort into. That’s a difficult question, but I would have to say Polyester Zine, Oyster Mag and Buffalo Zine are a few of my publication crushes. I gain so much inspiration every time I visit their sites. I think you might see some of that inspiration in the design of my layouts. I also really like photographers who capture environmental portraits that really tell you who their subject is just based on their surroundings. I would like to add more of that style to future photo-shoots/interviews. What does zine making mean to you? Zine making is a perfect match for my interests. I can get as hands-on with it as I want. I have no boss and no limitations. Meeting other zine makers is sometimes a surreal experience. People can be so imaginative and the fact that we have an outlet to express ourselves is really important. Zines have helped my artistic-block, anxiety, frustrations with society and my awkwardness in meeting other artists. How does someone submit art or articles to your publication? There are two ways. You can head over to artcultzine.com and click on the apply/submit link, (check frequently for open calls and deadlines!) or you can submit any information to artcultstudio@gmail.com.